What holiday do you think of when someone mentions costumes? Halloween? But have you ever thought of a costume for the holiday season at this time of year? The 1923 Dennison’s Christmas Book by Dennison Mfg. Co. gives three suggestions for holiday costumes. These would be the Snowball, the Christmas Fairy, and the Poinsettia. And they are all made from what else but crepe paper! Crepe paper is the main material in many of the holiday decorations shown in this trade catalog. Dennison Mfg. Co., Framingham, MA. 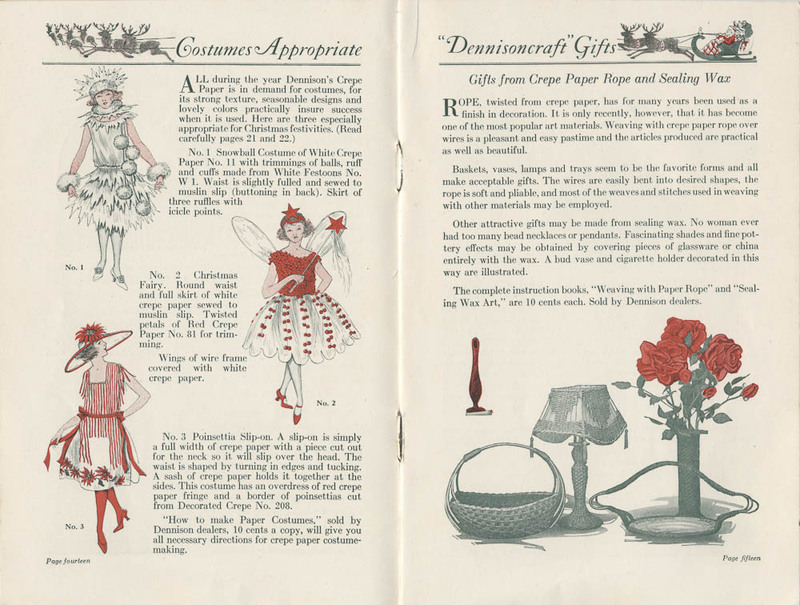 Dennison’s Christmas Book, 1923, pages 14-15, Snowball Costume, Christmas Fairy Costume, and Poinsettia Slip-On Costume and gifts made of crepe paper rope and sealing wax. The first costume is the Snowball. This costume is mostly made of white crepe paper but trimmed with snowballs, ruff, and cuffs made of white festoons. The skirt is sewed to a muslin slip and has three ruffles with icicle points. The next costume is the Christmas Fairy. This costume has a red top and a full skirt made of white crepe paper. The skirt is sewed to a muslin slip and trimmed with red petals made of twisted crepe paper. To make the fairy’s wings, cover a wire frame in the shape of wings with white crepe paper. Finish this costume off with a fairy wand topped with a red star. The last costume is the Poinsettia. This is a slip-on costume. A slip-on is “a full width of crepe paper with a piece cut out for the neck so it will slip over the head.” The slip-on for this particular costume is made from white crepe paper with a border of poinsettias at the bottom of the skirt cut from decorated crepe paper. It is trimmed with red crepe paper fringe. The costume is held together at the sides with a red sash made from crepe paper. Finish it off with a poinsettia trimmed hat! Wondering how to make the twisted petals for the Christmas Fairy or the fringe for the Poinsettia Slip-On? Then take a look at page twenty-one of this trade catalog. It includes directions for how to cut a strip of plain crepe paper straight and how to use crepe paper to make fluted or ruffled edges, twisted petals, fringe, and crushed crepe. And how do you make the festoons for the Snowball costume or a poinsettia to trim the hat for the Poinsettia costume? Take a look at page twenty-two for instructions on making crepe paper poinsettias, festoon balls, snowballs, and bells. Dennison’s Christmas Book and other catalogs from Dennison Mfg. Co. are located in the Trade Literature Collection at the National Museum of American History Library. Take a look at Galaxy of Images to see more pages on homemade holiday decorations from this particular catalog.